Next Saturday April 13th, 2019, we will host our annual Easter Egg Hunt and Breakfast at the Sadsburyville Fire Company. The event takes place in Fred Wolfe Hall and breakfast will be served from 8:00AM until 10:30AM. The meal includes pancakes, eggs, sausage, breakfast desserts, orange juice, coffee and chocolate milk. 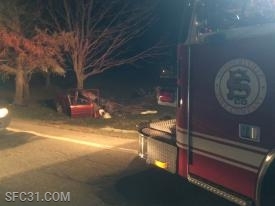 Engine 31-1 on scene of an auto accident on Lincoln Highway. At 1642 hours today the Sadsburyville Fire and Rescue and the Keystone Valley EMS were dispatched to the 3000 block of Lincoln Highway in Sadsbury Township for a multi-vehicle auto accident. The location put the accident on Lincoln Highway about 2/10 of a mile East of Old Mill Road. 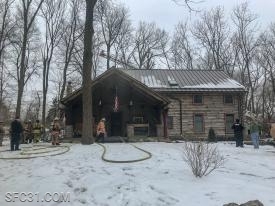 On Sunday March 3rd, 2019 at 1242 hours the box assignment was alerted for the 200 block of South Bonsall Road in West Caln Township. Engine 31-1 hit the street at 1244 followed by Engine 31-2 at 1246, both with staffing of 4 firefighters. Firefighters had two hose lines in service to extinguish the fire. 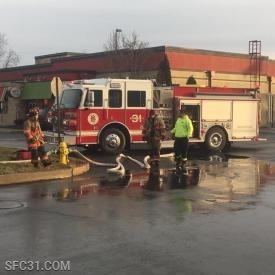 Engine 31-1 filling tankers from a fire hydrant off of Commons Drive. 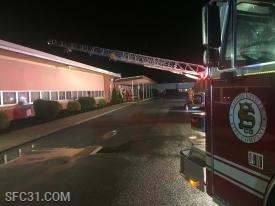 On January 7th, 2019 at 0701 hours the Keystone Valley Fire Department and some area mutual aid were dispatched for a building fire in the 600 block of Quarry Road in West Sadsbury Township. Engine 42-1 arrived first due at 0713 hours and advised of a working fire. 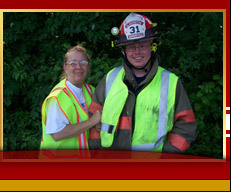 Saturday January 5th, 2019 brought two responses for our volunteers. Each incident Engine 31-1 was fully staffed and on the street within 4 minutes of being dispatched. Engine 31-1 on scene of a reported house fire on Timacula Road. Sadsburyville firefighters clean up an accident scene on Lincoln Highway. 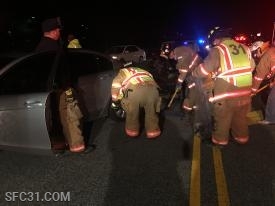 At 1726 the Sadsburyville Fire Company and Westwood EMS were dispatched to the 2800 block of Lincoln Highway in Sadsbury Township for an auto accident. Chief Grossman arrived on location at 1729 to find a two vehicle accident blocking the center lane of traffic. Chief Grossman assumed the Route 30 command and requested a second ambulance to the scene. On Saturday November 25th, 2018 the structure assignment was alerted for the 800 block of West Kings Highway in West Caln Township. This time for a building fire reported by the West Caln Township Police Department. The Sadsburyville Fire Company responded with both engines and staffing of 10 firefighters. Engine 31-1 on scene on the Alpha side of the reported building fire. 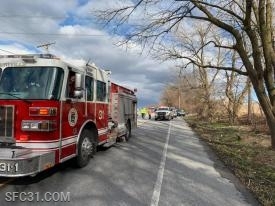 Engine 31-1 on scene of a serious auto accident on Route 10 north of Route 30 in Sadsbury Township. 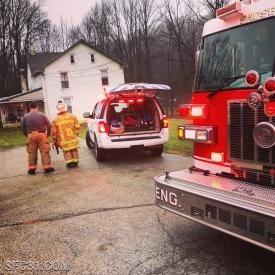 On the early morning of Saturday November 24th, 2018 the Sadsburyville Fire Company and Keystone Valley EMS were summoned to the 800 block of North Octorara Trail in Sadsbury Township for an auto accident. The call came in at 0206 and first responders immediately began to respond.